Android SMS Manager - How to Manage Text Messages on Android Devices? Like to or need to communicate with others via text message? 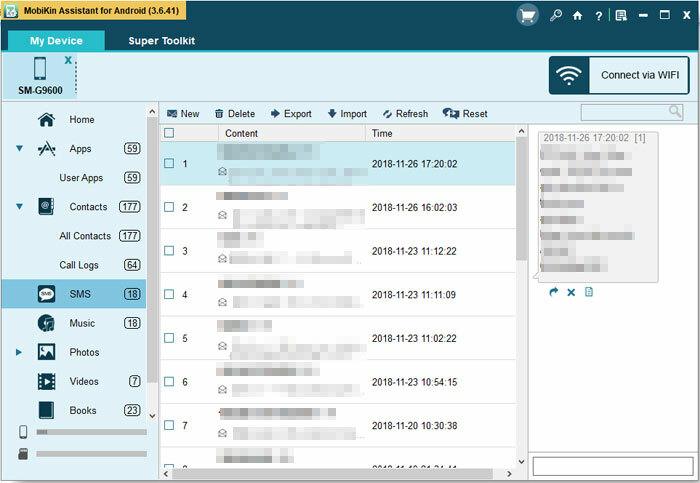 Then you need a powerful Android SMS manager program to be your assistant - a good SMS manager for Android can help you to transfer, delete, and send messages more effortlessly and effectively. And here, MobiKin Assistant for Android is a good option for you. With it, you are able to manage the text messages on your Android device with simple clicks. Let's have a brief look of this software! MobiKin Assistant for Android is a desktop program designed for Android users. It aims to help its users manage their phone data more easily and expediently. 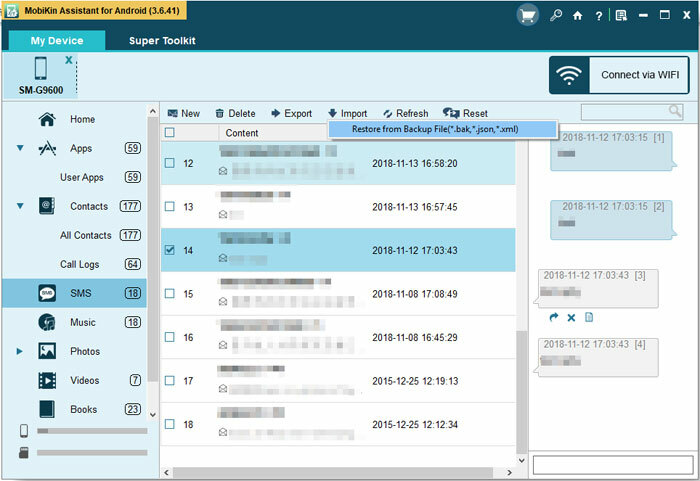 With it, you can manage all the files on your mobile phone without any hassle, including contacts, text messages, call logs, music, videos, photos, applications and so on. If you are using an Android device, you cannot miss this powerful tool. There are two versions available - Win and Mac. You can choose the one you need and click the corresponding icon below to download and install it. And now, you can start to manage your messages on computer without restriction. First of all, you can tap the "SMS" option located in the left panel of the main interface. Then all the text conversations on your phone will be displayed in the right panel. Here, you can key in one or two keywords in the searching box so you can find the wanted conversations quickly and view them easily. When you receive, send or delete a message on your phone, you can click the "Refresh" button to reload the messages. 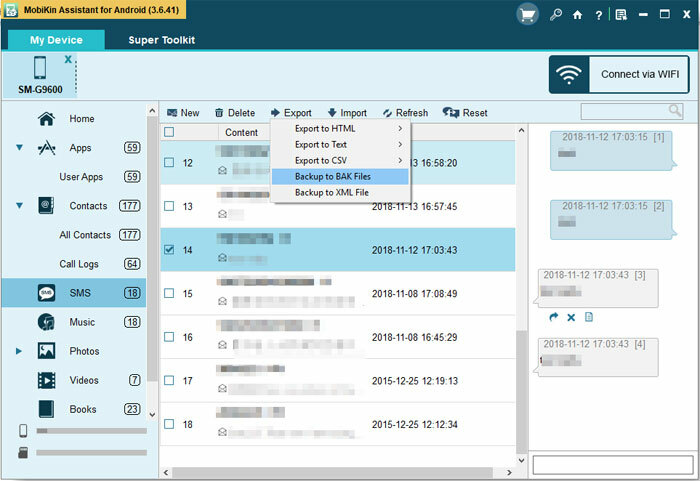 - Hit the "Export" button at the top menu and then you can select to "Export to HTML/Text/CSV" format or "Backup to BAK/XML Files". After transferring the messages to computer, you are free to print out or edit them. - Click "Import" from the top menu and tap on "Restore from Backup File (*bak, *json, *xml)" option. - Select the wanted files and begin importing them to your mobile phone. So long as you insert a SIM card to your Android phone, it is inevitable that you will somehow receive some spam messages. But it doesn't matter. This assistant tool can help you clean them easily. - Tap on "Delete" to remove all the selected conversations. - Finally, you can hit the "Send" button to send the message. On the program, you are capable of resending, forwarding and copying messages as well. - Copy: Move the mouse to the message that you want to copy and then select the "Copy" icon. After that, you can paste it anywhere you like. When you move the mouse to the message, you will see that there are 4 icons actually - resend, forward, delete and copy. Unlike the "Delete" function we mentioned above, the "Delete" icon here empowers you to remove individual message rather than the whole session. So if you wish to delete one message in a conversation, you can select this feature. It is really a good Android SMS manager tool, right? However, it can do more things in fact. 4. 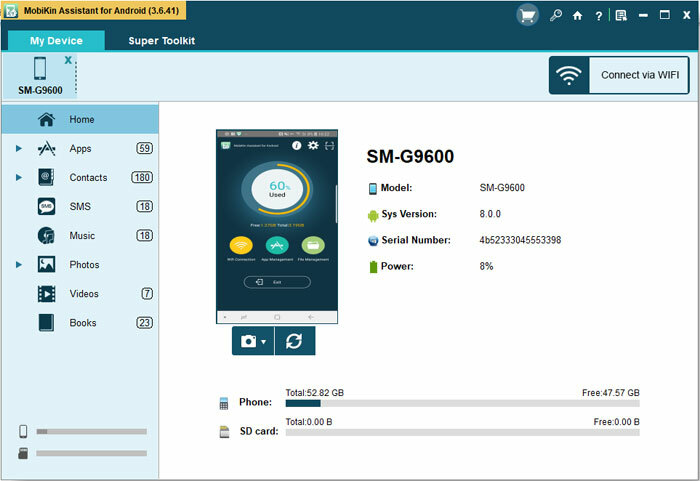 Manage Multiple Android Devices: You can use this program to manage multiple Android devices at the same time. 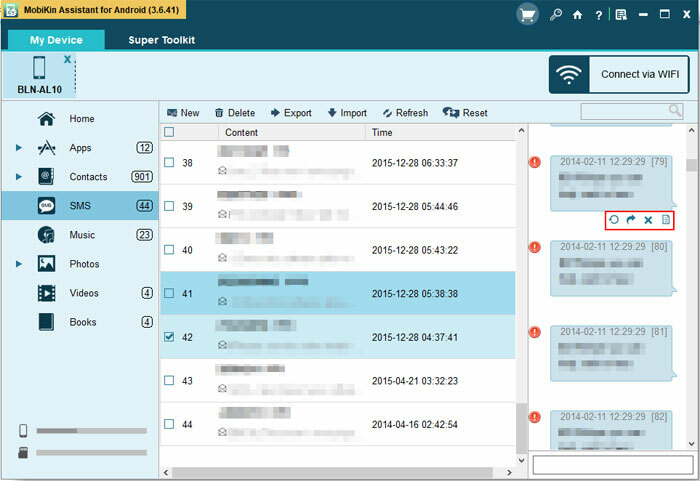 Now are you interested in this powerful Android SMS manager tool? If you are, just don't hesitate to download and install it on your computer and begin your Android SMS management. And if you have any problem about the SMS manager for Android, please feel free to contact us. Android Call Log Manager - How to Manage Call History on Android Easily? 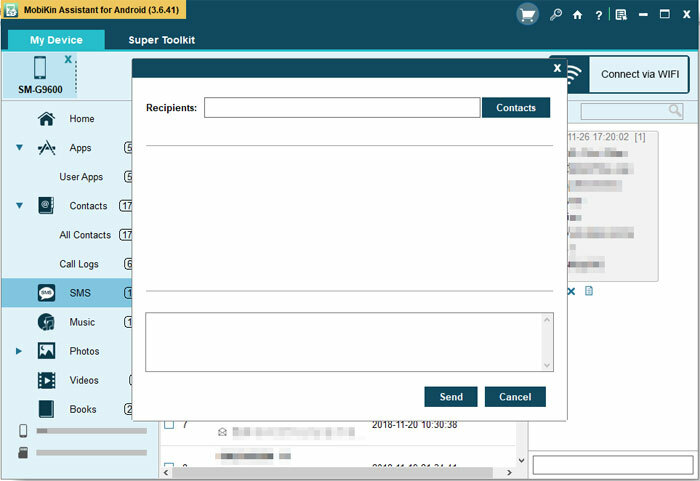 How to Manage Android Contacts with Android Contacts Manager? How to Manage Android Ebooks on Computer?